DynDNS is a Windows client for DynDNS dynamic DNS service which keeps your IP address updated with the DynDNS hostname. Long available for users of certain Linux-based routers, it is now available for Windows users. Since your ISP-assigned IP address changes every now and then, it can be annoying to have to always update your DynDNS account manually. Instead of manual updates, Dyn Updater will periodically check your IP address and if it has changed, automatically update your DynDNS account. Version 5.4.6 is a freeware program which does not have restrictions and it's free so it doesn't cost anything. 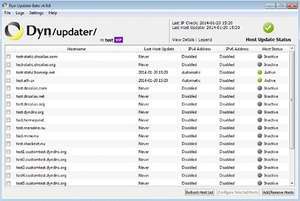 For security reasons, you should also check out the Dyn Updater download at LO4D.com which includes virus and malware tests. Additional screenshots of this application download may be available, too. 4 out of 5 based on 62 ratings.